Sofitel Manila has released an official statement in response to calls from UNTV and the network's supporters to boycott the luxury hotel. The hashtags #NoToSofitel and #BoycottSofitelPH occupied the Philippines trends box Monday, July 14, after UNTV chairman and CEO Daniel Razon posted his sentiments against the establishment for removing the public service network from its hotel TV channels. The establishment's Twitter account, @SofitelManila, posted the following explanation on Tuesday, July 15, 2014. “We do not discriminate against any local or international broadcasting television channel. While we supply several television channels for our guests, the channels we air in the hotel are system-limited, and regularly changed based on several factors, including guest feedback and demand. We are happy to hear the public’s concerns, and will consider to re-instate the UNTV Channel if this is a request from our hotel guests”. 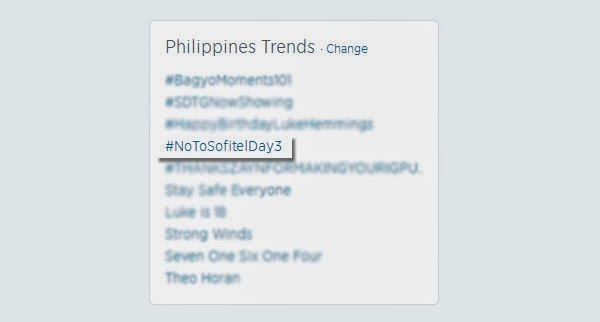 Despite the official statement from Sofitel Manila, the hashtag #NoToSofitelDay3 still trends on Twitter as of this posting.